When I was little one of my favorite things was maps (remember the ones that came in National Geographic issues? Those were my favorites) and that love of maps is something from childhood that I still carry with me. 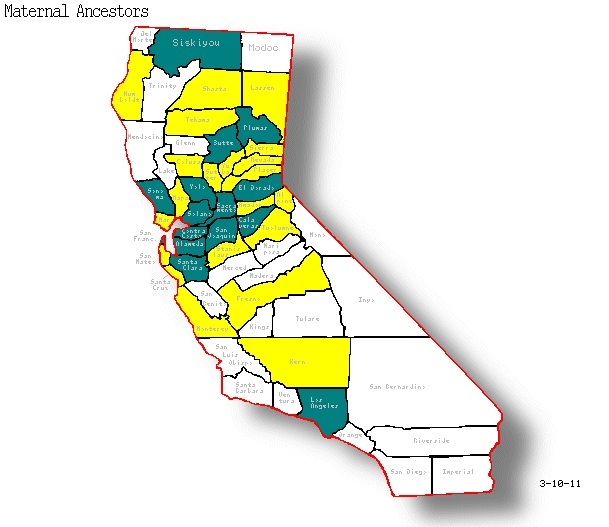 For a long time I've wanted to combine my interest in maps and genealogy in the form of a "genealogy atlas" and while I'm still trying to perfect both the idea and look, I've found a website that has proved helpful. The website, which is very easy to use, was developed through Texas A&M University and is here (note: only US states and counties within states can be color-coded). States marked in dark blue are where my known direct ancestors lived, either briefly or for generations. States in medium blue (CT, TN, NC) are ones that brick wall ancestors of mine said their parents were from in the 1880 census, but I do not conclusively know how accurate that information is at present. My ultimate goal is to one day have an heirloom quality genealogy atlas in book form but this (and Google Maps) are good practice. I especially like the maps above because, even though they aren't very detailed, they are color coded and I think easier for a non-family history buff to use and appreciate. I know RootsMagic produces a program similar (and I think better) than a lot of the free mapping options out there like GoogleMaps. In case you're wondering, the program is called Family Atlas and yes, it is at the top of my wishlist. Disclosure: I am in no way affiliated with RootsMagic nor did I receive any remuneration or was prompted to write this post by any outside party. I use RootsMagic Essentials, the free and striped down version of RootsMagic and plan to one day upgrade. What a nifty tool. Thanks for sharing! I love maps! I'd seen this tool, but I wasn't quite sure what to use it for. Thanks for all the great ideas! This is outstanding - I'll have to give it a try. Thank you for posting on this! Thank you for the time and effort you put into your blog. I have chosen you to receive the "One Lovely Blog" award. You may stop by my blog to see the rules that go along with accepting this award. I’ve awarded you the One Lovely Blog Award! Please visit my blog at http://fantastic-electrisoil.blogspot.com/ to pick up your award! I have chosen you for the "One Lovely Blog Award!" Please visit my blog, Genealogy Simple & Fun: http://genealogysf.blogspot.com/2011/03/one-lovely-blog-award.html for your badge and acceptance rules.